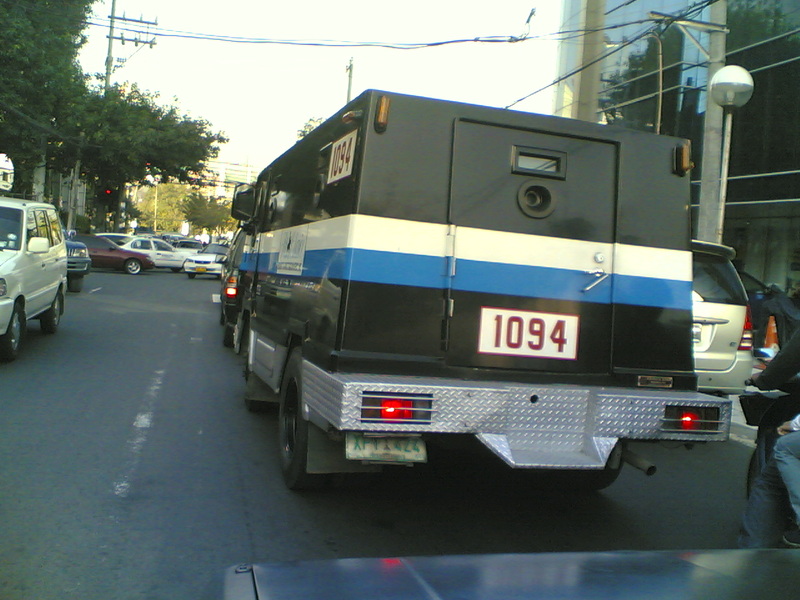 Armored vans carrying huge amount of money and other valuables are among the worst traffic violators in the country. 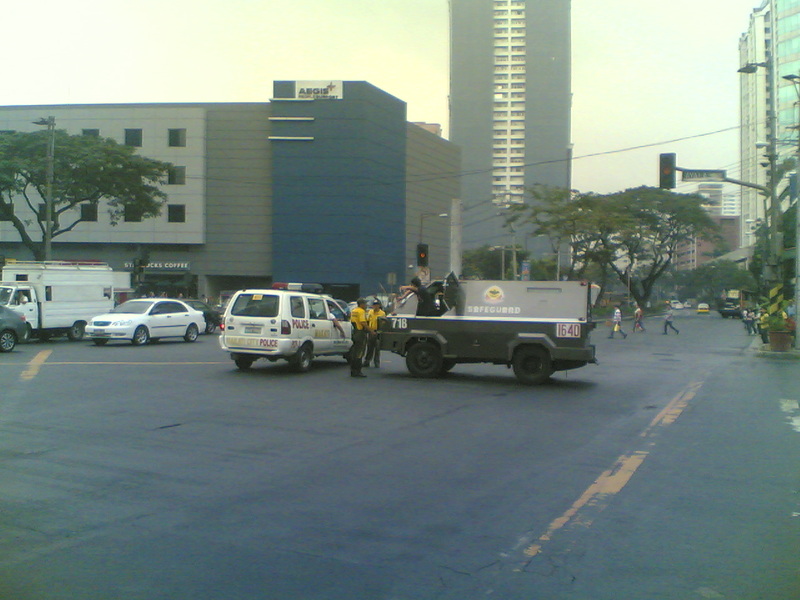 They counter-flow with impunity, make left-turn or U-turn on "No left turn" and "No U-turn" corners, they park on no-parking areas. Not all the time that their drivers and personnel are lawless elements on the roads, but most of the time, they are simply lawless. 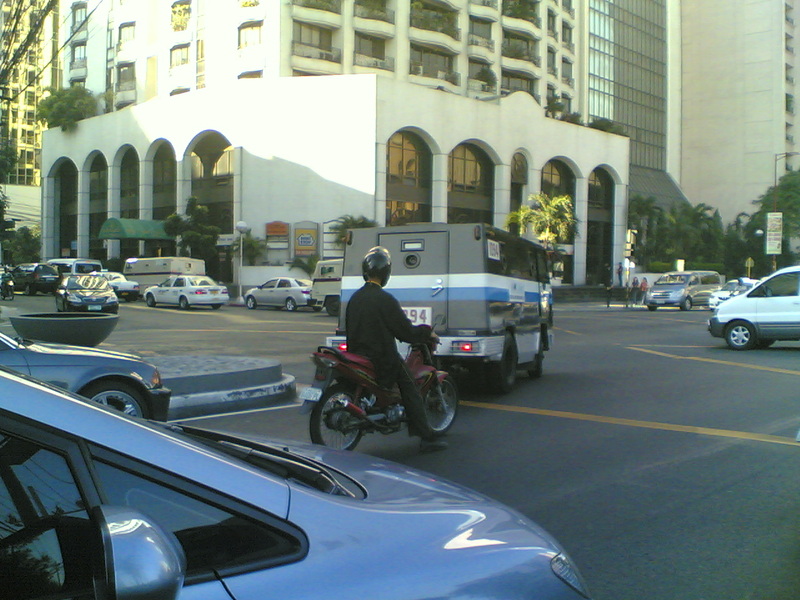 In this picture, an armored van getting (or delivering) money for a bank in Leviste street in Makati. 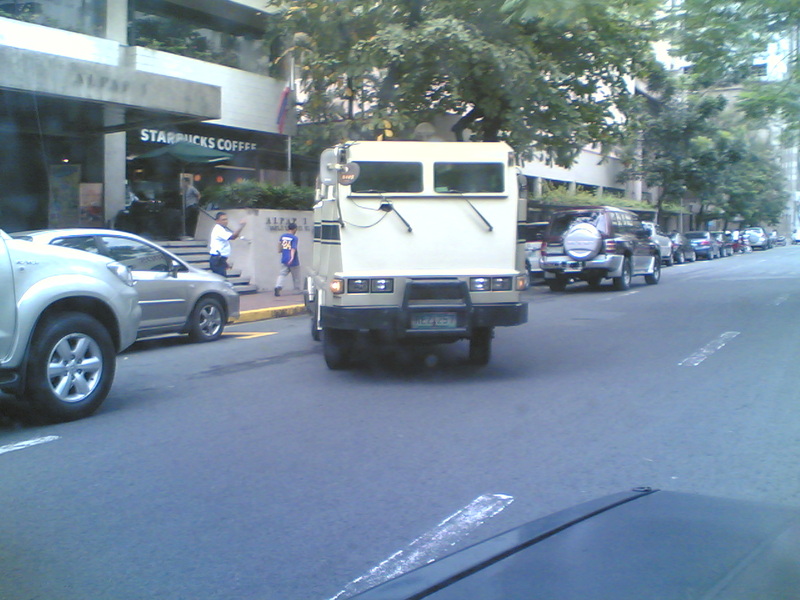 This is a one-way street but this van is facing the incoming vehicles. Idiot and lawless people. This van actually cut my path while I was driving my toddler daughter to her school in Makati. I knew the plan of that van's driver -- he will make a left turn on a "No left turn" street in Buendia corner Malugay stree, Makati. Note that their plate no. is not easily visible, only their body number is visible. And true enough, he did take a left turn on that street. Another idiot and lawless motorist on the street. 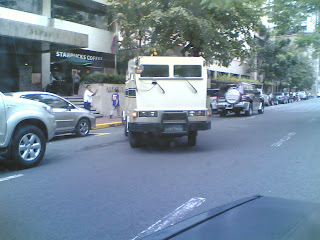 Most policemen and government traffic enforcers just allow these lawless people to violate traffic laws with impunity. That has been my observation and hypothesis for a long time. This idiot armored van driver was stopped by 2 traffic enforcers this morning on a busy Ayala-Buendia intersection for some traffic violation. 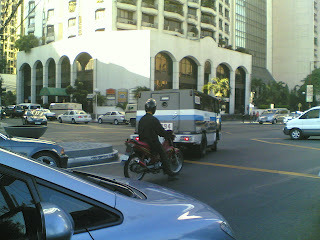 The idiot driver argued with the traffic officers. 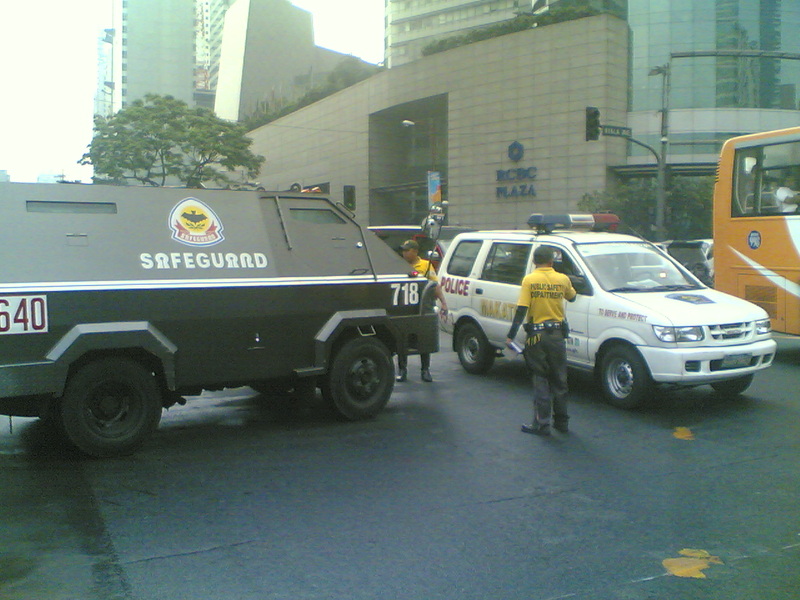 His driver's license was being demanded by the traffic officers, and he would not give it and gestured as if he owns the road and should not be penalized for whatever traffic law violation. Other side of the scene. 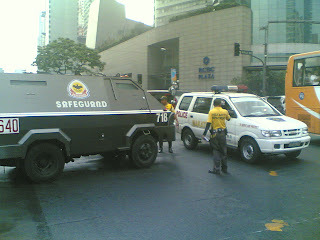 Makati police car blocked his path as the idiot driver was still arguing that he is right. This mini-drama caused additional traffic build-up on that busy morning on a busy intersection. Ordinary motorists like me cannot discipline these rogue drivers. They drive an all-metal vehicle, they have guns and their people are ready to shoot for whatever reason or alibi. Thus, policemen and govement traffic officiers should check these idiots on the roads. I am happy that today, at least one idiot was given a lesson. In full public view.